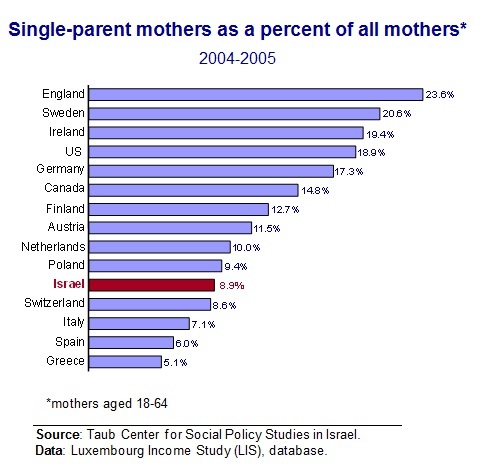 A Taub Center study compares single mothers in Israel with those in other developed countries. Single mothers are among the most vulnerable members of society. These mothers have a significantly greater burden of household duties than others, with no one to share in the tasks of housework and childcare; they also have considerably fewer economic resources since the amount of economic support they receive from the father is often quite minimal. In “Welfare and Employment among Single Mothers,” the former Chair of the Taub Center’s Social Welfare Policy Program, Professor Haya Stier, a Tel-Aviv University sociologist, examines how such mothers in Israel fare compared to single mothers in other developed countries. One aspect of the study is demographic. Stier reveals that while the number of single mothers in Israel is rising, their share of the total population is still low on an international basis. The first figure shows that 8.9 percent of mothers in Israel are single, lower than the rate in three-quarters of the countries studied and less than half the rate of England, Sweden, Ireland, and the US. 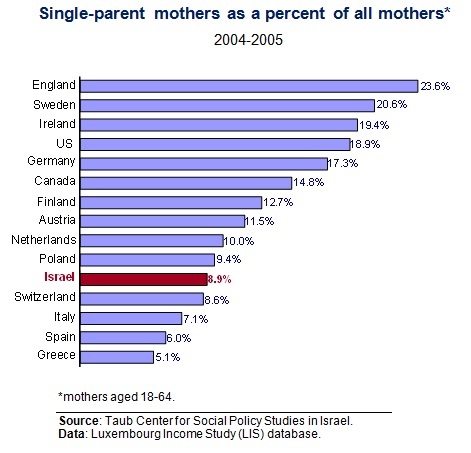 Another finding regards the composition of single mothers in Israel. Stier finds that only 14 percent of Israeli single mothers have never married; only two countries in the sample had a lower rate. The study then turns to the economic circumstances of the mothers and to government policy. In the 1990s, Israeli policy was considerably more supportive of single mothers than it is today; the 1992 Single Parent Families Law granted special eligibility conditions for income support to single mothers. This legislation substantially improved the economic status of families headed by single mothers. It was also accompanied by a certain decline in single mothers’ labor market participation rates, but this decrease mainly characterized women whose chances of success in the labor market were already low. In the early 2000s, benefits were considerably reduced, while programs encouraging greater women’s participation in the labor force were implemented. Labor force participation of Israeli single mothers rose and is currently high; in 2004-2005 it was 67 percent, greatly exceeding the 59 percent rate for mothers with partners. A narrow focus on employment, though, may ignore the constraints faced by single mothers seeking employment, including for example, the presence of young children in the home, childcare costs, a lack of quality, subsidized childcare options, limited labor market mobility, and the like. Research findings indicate that although the early-2000s policy changes did help raise single mothers’ labor force participation rates, they nevertheless failed to improve their household incomes in a significant manner. 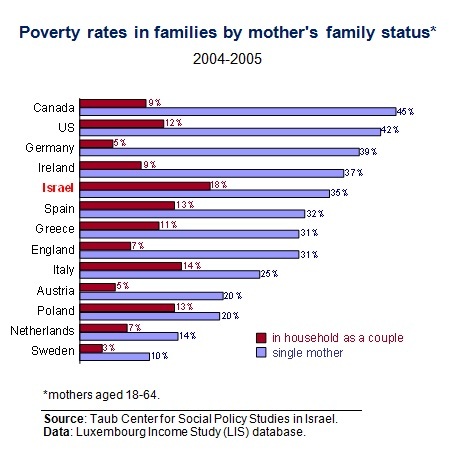 Accordingly, Prof. Stier shows in the second figure that Israeli households headed by single mothers have a poverty rate of 35 percent, about twice the rate for households where the mother lives with a partner. The Taub Center study concludes that Israeli single-parent families are relatively poor, compared both with Israeli two-partner families and with single-parent families in other Western countries. One reason is a comparatively low level of public support: single mothers in Israel obtain about 25 percent of their income from transfer payments, a rate lower than that for most countries studied by Stier. Israel was found to be among the lower ranking countries (e.g., US, Canada and Ireland) in terms of the level of support that it offers to single mothers, and in terms of the resources that it devotes to raising these mothers out of poverty. Stier notes that Israeli policy has been oriented towards increasing employment of single mothers, yet due to the meager level of government benefits, increased employment has not been reflected in a commensurate increase in income and standard of living. She recommends that a comprehensive policy should be implemented. Such a policy would include ensuring the availability of quality childcare so as to empower single mothers to genuinely improve their standard of living through paid work, as well as guaranteeing an adequate level of income for all single mothers.